April « 2015 « S.L.Á.T.U.R. 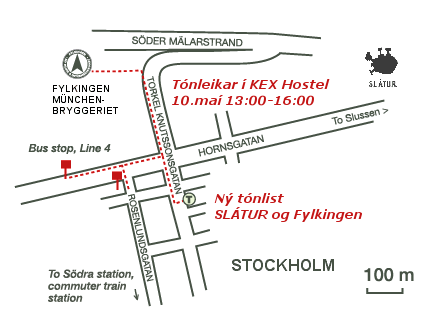 Tónleikar í KEX Hostel, sunnudaginn 10. maí klukkan 13:00 – 16:00. Meðlimir S.L.Á.T.U.R. leika eigin verk ásamt góðum gestum úr Austurvegi, þeim Katt Hernandez, Gus Loxbo, Maríu Horn og Mats Erlandsson sem tilheyra sænsku tilraunatónlistarsamtökunum Fylkingen. Dagskráin er hluti af fjölskyldudagskrá KEX og eru börn sérstaklega velkomin. Fylkingen is a venue and artists’ society for new and experimental work in music, performance, video, film, dance, sound-text composition and intermedia. Since its establishment in the 1930s, Fylkingen hasbeen committed to experimental work in the contemporary performing arts. The organisation is made up of over 250 member artists from many disciplines who use the venue to develop and present new work. Continue reading Fylkingen & S.L.Á.T.U.R.